Lir Space: Tell Me a Tale! 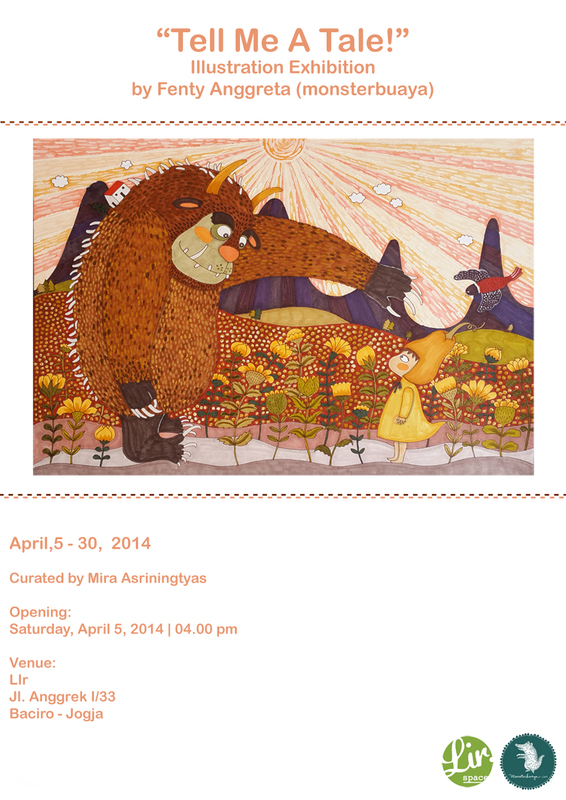 “Tell Me a Tale!” is an illustration exhibition by Monster Buaya (Fenty Anggreta). Instead of exhibiting stories with picture, Monster Buaya creates pictures that tell stories. The folklores that is commonly passed through generations verbally is exhibited in its visual reinterpretations; leaving the whole tale to the power of visual communication. “Tell Me a Tale!” adalah pameran ilustrasi oleh Monster Buaya (Fenty Anggreta). Alih-alih memamerkan kisah-kisah dengan gambarnya, sang seniman menciptakan gambar yang menceritakan kisah secara visual semata. Cerita rakyat yang secara umum diwariskan dari generasi ke generasi secara verbal, kini digambarkan melalui reinterpretasi visual; menyerahkan seluruh kisah dalam kekuatan komunikasi visualnya. How simple is that request compared to its ability to make people bond in a special way. The request is commonly asked by children to their parent, sister to sister, and between friends. When it comes to a folklore, the tale is told in the voice of the individual telling the story. Some people follow the storyline, while some others choose to create a whimsical world of their imagination. Parents use the bedtime story moment to introduce cultural and moral educations to their kids while sisters and friends use the moment to craft their imagination, bonding their emotion, and introduce new ideas. When we look back to the benefit of reading fables and folklore, it can be a way to understand people in many different side of the world. Aren't people tend to be more friendly and kind to things they can understand? Folklore can also be a way to bond with a community, pass down the tradition and history from generation to generation to continue building faith between communities. In Indonesia, a place so rich in culture and communities, folklore are naturally abundance. Back when Indonesia was colonialized and the people are not yet well literate, the verbal story telling used to be more well-nourished rather than the written tradition. The exhibition consist of three series of works that were inspired by Indonesian folklores: Timun Emas (The Golden Cucumber), Kancil Mencuri Timun (The Mouse Deer who Steal Cucumber), and Bawang Putih Bawang Merah (The Garlic and the Shallot). Instead of exhibiting stories with picture, the artist creates pictures that tell stories. The folklores that is commonly passed through generations verbally is exhibited in its visual reinterpretations; leaving the whole tale to the power of visual communication. It is like bringing 'the reader' back to the wonder of pastime with the sensation that children feel in front of books with only the colorful pictures to understand. That is also to resist the universal interpretation of narratives and allow the storyteller to create their own oral version of folklores that is told very often for Indonesian children. What used to have their own cultural moral and values are now deconstructed and freely told according to individual impression of merely the brightly colored and rich in detail drawings. In this exhibition, the tale to be told has its own sprite and all you need is a little bit of imagination. The original stories are about the struggle of common protagonist who is kind, smart, and gentle against the bad and the mischievous. In this exhibition, the border between the good and the bad is presented in a very thin line. There are no such thing as a bad or unkind person; yet, there is no perfect kindness as well. Everything is about different personalities and wit. In the original Javanese folklore version, The Golden Cucumber is telling about a girl's attempt to escape from evil giant who tries to catch and eat her. Here, the giant is just trying to be friend with her and misunderstood by the nosy little girl. Instead of an attempt of fleeing from the giant, the magical cucumber seeds, needles, and salts are more like a game. The Golden Cucumber finally felt bad about the volcanic mud of magical shrimp paste (that somehow green instead of boiling red) which starts to hurt the giant and she helped him and finally be friend. The Mouse Deer story is a tale of clever and cunning mouse deer who uses its intelligent advantage to triumph over beings more powerful than itself. Instead, it is about a relationship between the Mouse Deer (who is a pictured as a sly girl living in a sweet house) and the Scarecrow. The reader and storytellers are free to create their own plot using the available maps and images. The Garlic and Shallot story is about two half-sisters who both are beautiful but have completely different personalities. The story held a cultural symbolic value about the bad (red) and good (white). In this series, the Shallot is simply more extrovert, witty, and tomboy compared to the introvert and sweet Garlic. There is nothing vicious about the Shallot's personality and even the crocodiles are strong and protecting. They are just different and that is okay. At the end, the are all living a happy life (or are they?). The artist herself is living a fictitious fable-like life with his husband and six rabbits she believed to be able to communicate with her. Her drawings are quirky and at the same time melancholic. It's funny how easily I relate to the pictures and stories in her drawing.. yet at the same time, her whole family feels a complex resemblance of themself and the characters shown at this exhibition. The giant have a physical resemblance with the artist's husband, the cucumber looks like her little brother, the other characters look like her mother, and the stories are like that of her love story. For the people around her, the exhibition has a thin line between the fiction and reality. At the end, it almost like the artist is drawing a family portrait and self portrait about her life. It can also be seen as a complete series of her love story: witty, romantic, and melancholic. But then again, aren't we all the hero and heroine of our own fictitious life? This, my friend, is how I tell the tale. As for you dreamers, story-tellers, magic-bean buyer.. please tell me a tale!